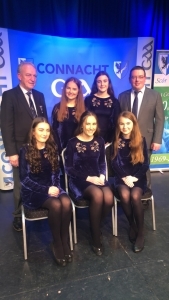 2019 Connacht Scór Sinsir Finals – Glory for Aughnasheelin. The first Leitrim performance to take to the stage was St Marys in the figure dance. The ladies gave a fabulous performance but St Dominic’s in Roscommon danced through to the All-Ireland. In Solo Singing Michael Burke of Ballinderreen, Galway won the Connacht title seeing off Leitrim’s Sinead Egan of Aughnasheelin. Achill of Mayo took the Instrumental Music in a very talented and diverse music competition, winning over Leitrim’s 5 St Mary’s ladies team who received great rapture from the audience but unfortunately not the judges choice and Achill retained the win for Mayo for a second year. Recitation was a very entertaining competition and Mick Rock of Elphin, Roscommon, was declared the winner. Credit to St Mary’s Kathy Butler and her witty piece representing Leitrim so well. Leiriu winner was Elphin of Roscommon, Leitrim had no entry in this competition. Aughnasheelin made a welcome comeback in Set Dance. Despite a steady solid performance it went once again to Aughamore of Mayo. The All-Ireland Finals will be held in The Royal Theatre, Traveller’s Friend hotel, Castlebar, Co Mayo on Saturday, April 13th at 3pm. Please note it is a ticket only event, tickets are priced at €20 (adult) €10 (u16). Please note tickets are non-refundable once any order is placed. They can be ordered through your club officer or county board officials. All orders must be placed by MARCH 27TH. Wishing Aughnasheelin and all of the Connacht winners the best of luck. http://www.leitrimgaa.ie/wp-content/uploads/2017/10/Scor-logo.png 1000 1000 Leitrim GAA PRO http://www.leitrimgaa.ie/wp-content/uploads/2017/07/cropped-Leitrim_Crest_3d_Trans_552x552-180x180.png Leitrim GAA PRO2019-03-14 20:41:032019-03-14 20:41:032019 Connacht Scór Sinsir Finals - Glory for Aughnasheelin. The All-Ireland Scór na nÓg final will be held this weekend, Saturday 17th February in the TF Theatre Castlebar, Co Mayo. The stage competition starts at 3pm sharp. Please note this is a ticket only event. If you have not pre-booked tickets please check with club Scór officers for availability before travelling to the finals. Leitrim is honoured to have 9 young people from the county compete in this year’s final. A phenomenal amount of talent and a great achievement for our small county. Ballad group representatives from St Marys Kiltoghert are no strangers to the All-Ireland Scór. Saturday will be the group’s 4th consecutive year to compete at all Ireland. Ballinamore Sean O’Heslin’s club represents Leitrim in the table quiz. The team will be hoping for a good result on Saturday. This event will be held at the De La Salle Sports Hall, Castlebar at 11am sharp. Entry to the quiz is free of charge. The Senior Scór County Final took place last Saturday, February 9th in St Marys Hall, Carrick on Shannon. Declan Bohan PRO of Leitrim County board hosted as Fear an Tí for the evening’s stage competition Though disheartening not to have an entry for all 7, It was strong and very entertaining competition. Leitrim has a tradition at all Ireland level from past years and it was disappointing to see no club entry for Leiriu once again. Something for the county to work towards going forward, given the legacy of past all Irelands won in this competition. However, it was fantastic to have some familiar faces returning to Scór Liatroma aris. Maith sibh go Leir. Leitrim County Medals were presented to the winners by Leitrim County Board Chairperson Terance Boyle. The Cormac MacGiolla Shield for Club na Bliana was chosen by the panel of judges from Westmeath. Cultural Officer Sheila McNulty from Aughnasheelin accepted the award which was presented by Ailbhe McGill, Bornacoola. The Leitrim representatives will go onto compete for a Connacht title in Balla, Co Mayo on the 11th March at 3pm. Leitrim will be hoping for winners to go forward to the All-Ireland final which will be held on April 13th in the TF Royal Theatre, Castlebar, Mayo at 3pm. The Leitrim Senior Scór quiz will take place on Friday 22nd February. Club tables comprise of 4 people aged over 17 effective January 1st 2019. Clubs are welcome to enter as many teams as they wish. The winners of the Leitrim county final winners will qualify for the All-Ireland in Castlebar on April 13th. They will also take part in a Connacht round in Balla on March 11th. The Connacht round was introduced to provide teams with an opportunity to sit the quiz once more and a Connacht title medal will be presented to the winning team on that day also. 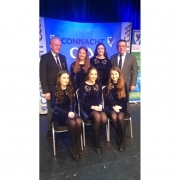 Coiste Scór Connacht and Sligo IT host this weekends All Ireland Senior Scór Final. Kathy Butler of St Mary’s was chosen by the National Committee to take on the coveted role of Bean an Ti on stage. An honour for the Carrick lady and for the St Marys club. Laura Crossan having previously had the honour of the same role at Scór na nog in Belfast’s Waterfront Theatre in February of last year. Aughnasheelin represents Leitrim & Connacht in Ballad Group. Brendan, Cait & Sile having sung with the group who won the All-Ireland title back in 2006, the club will be hoping to add to their medal count this Saturday. Bornacoola Quiz team are the Leitrim county winners taking part in the 32 county All-Ireland Table Quiz. They also have previous All-Ireland medals, having last won in Killarney in 2012 when the quiz competition took place in the old stage format. Quiz starts at 11am sharp in the ballroom of the Clayton Hotel Sligo. Entry to this competition is free of charge. The main stage competition starts at 3pm in the Institute of Technology Sligo’s Knocknarea Arena. There is a limited number of tickets through the box office available on the day, Tickets are priced at €20. Coiste Náisiúnta scór are delighted to announce the final will be broadcast live on TG4 YouTube. Wishing Kathy & the Leitrim Competitors the very best of luck, Liatroim Abú. Scór na mBunscoileanna – The Scór na mBunscoileanna took place in Cloone Community Hall last Friday 9th of March. Eleven schools took part and a staggering 254 children. The standards of performances were an absolute credit to the schools, parents and teachers, the children really promoted the culture and talent of the schools. Some very strong and youthful contenders to possibly go forward to Scór na nÓg next Autumn. Question Time was a tough competition with teams with top marks right to the end on both nights. Many thanks and credit to our Bean an Ti, Friday night was compered by St Marys Laura Crossan who kept the busy evening ticking over at a steady pace. Medals in each event were presented for first, second & third places. Very strong performances and big numbers in Solo Singing & Recitation, to which the judges also gave joint places unable to decide between some performances. The Cormac Mac Giolla shield for the best school overall was won by Annaduff National School. School of the Year – Annaduff N.S. The County Final took place last Saturday, March 10th in the Mayflower, Drumshanbo. Carrigallen’s Aoife Ni Mhaille hosted the Senior table quiz final & Bean an Tí for the evening’s stage competition was St Mary’s Laura Crossan. Though disheartening not to have an entry for all 7, It was strong and very entertaining competition. Leitrim has a tradition at all Ireland level from past years for being strong in Figure, Leiriu and Music, disappointing to see no club entry for any of these on Saturday night. However, it was fantastic to have some familiar faces returning to Scór Liatroma aris. Maith sibh go Leir. The quiz was held in the full table quiz format prior to the stage competition. Bornacoola emerged the winners after a tight 10 rounds were complete. Bornacoola are now our Leitrim team for the 32 county All-Ireland final. It will be held on April 14th in the Clayton Hotel Sligo at 11am. Leitrim County Medals were presented to the winners by Chairperson of Leitrim Coiste Scór Chairperson Claire Crossan. Brid Sullivan from Ballinamore accepted the Cormac MacGiolla Shield for Club na Bliana, proudly presented by Ailbhe McGill, Bornacoola. The Leitrim representatives will go onto compete for a Connacht title in St Johns Hall Lecarrow, Co Roscommon on bank holiday Monday 19th March at 4pm. Leitrim will be hoping for winners to take part in the All-Ireland final to be held at 3pm also on April 14th in the Knoacknarea Arena IT Sligo. As a result of further overnight snow in some areas and frosty conditions, it has been decided to postpone Scór Sinsir until next Saturday, March 10th. Apologies for any inconvenience caused. As a partial thaw has set in and the majority of county primary and secondary roads are clearing well of snow this afternoon, the Leitrim Scór Committee will make a firm decision tomorrow morning regarding the Scór Sinsir Finals which are scheduled to go ahead in Drumshanbo tomorrow evening. If any area is further affected by overnight snow please inform Scór Rúnaí Claire Crossan at 0876472547 asap tomorrow morning. As is stands the event is still on tomorrow evening. The All-Ireland Scór na nÓg final will be held this weekend, Saturday 17th February in the Knocknarea Arena, IT Sligo. The competition starts at 3pm sharp. Please note this is a ticket only event. If you have not pre-booked tickets please check with club Scór officers for availability before travelling to the finals. Leitrim is honoured to have 18 young people from the county compete in this year’s final. A phenomenal amount of talent and a great achievement for our small county. St Mary’s figure dance team are heading to the competition for their first National final in this junior competition. Full of fresh enthusiasm -wishing the young ladies the very best on Saturday. Another first for the talented Amelia Pajak from Mohill. Amelia represents Leitrim & Connacht in solo singing, a beautiful sweet voice that is sure to see her do very well. Her all Ireland appearance mirrors the St Marys dancers – both having won their first Connacht’s this year and both making an All-Ireland debut this weekend. Ballad group representatives also from St Marys but are no strangers to the All-Ireland Scór. Saturday will be the group’s 3rd consecutive year to compete at all Ireland. Ballinamore Sean O’Heslin’s club represents Leitrim in the table quiz. The four boys will be hoping for a good result on Saturday having seen off 9 other clubs in a tight Leitrim final and going on to win the Connacht round of the competition. This event will be held at the adjacent Clayton Hotel at 11am. Entry to the quiz is free of charge. Senior Scór is going straight to the County Final once again. It will be held in the Mayflower Drumshanbo on the 3rd of March with the county title winners going forward to the Connaught final in on Monday 19th of March at 4pm. The Leitrim final will start with quiz at approximately 6pm, followed by the main stage, approx. 7.30pm. Entries for the Leitrim final to be submitted by a return of email irishculturalofficer.leitrim@gaa.ie by Monday 26th February. Connacht Scór final takes place on bank holiday Monday at 4pm in Lecarrow, Roscommon (Provisional Venue- to be confirmed), followed by the All -Ireland in the IT Sligo on April 14th.